Used like a chamois, this soft, absorbent PVA sponge towel offers a significant innovation over the original PVA Shammy. Smooth on one side for good absorption; honeycombed textured on the opposite side for easy wiping. Absorbs 50% more liquid than natural chamois or terry towels; wrings out to absorb again all day. Durable due to its reinforced center mesh, lasts almost forever, wash n' reuse. Safe on clear coat paints and all household surfaces. Available in blue, green, and yellow with convenient storage tube or flat packed in plain bag (no tube). 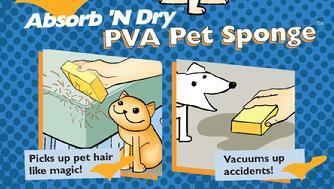 The Super PVA Sponge Block - Your Pet's Best Friend!! Forget using the Sham Wow! cloth material. The The Super PVA sponge block is a highly absorbent sponge with a very smooth surface (130 micron pore size). Spill a glass of wine on your expensive carpet? No problem, simply depress the sponge in the stain, release to vacuum up to 8 - 10 ounces of spilled liquid - without dripping!! Great for spills in the kitchen, on upholstery, or defrosting the fridge or freezer. Have a pet? Yes, it picks up both pet hair and urine like a magnet. Rinses out quickly leaving no pet hair on the sponge. Machine washable. 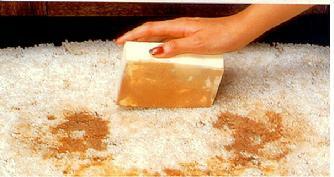 Try this application: Saturate the The Super PVA sponge block with fresh water (squeeze out excess). Place it in your refrigerator on the middle shelf. The Super PVA sponge block will absorb odors and hydrate the refrigerator. When it becomes dry, wash with soap in a sink or with your normal laundry, re-wet, and place again in your refrigerator. It does the same as baking soda - without the mess - and can be used again and again and again! This sponge is also called "the marathon sponge." You probably saw it at the Olympic Games in Beijing where marathon runners used them during the race in order to stay hydrated and cool! And, the Chinese also use this product as their "secret weapon" when playing ping pong. They use it to clean the surface of their paddles to give them a better edge for their phenomenal serves and returns. Durable, lasts almost forever, wash n' reuse. The Super PVA Vacuum Sponge Block was previously marketed as Slurpex in the USA, Europe, and Australia! Note: Current product is white in color for both sizes. Quickly Makes a Wine, Soda Pop, Tea, or Coffee Spill a Quickly Forgotten Event. Paper Towels and Sham Wow! Can't Match The Super PVA Sponge Block!! Soft, absorbent PVA sponge. Round shape fits hand perfectly. Natural sea sponge-like pores. Two sizes for smaller and larger surfaces: 4" - holds up to 4 ounces of liquid and 5.25" - holds up to 6 ounces of liquid. Great for cleaning walls, autos, paint texturing, grout cleanup. Very durable, chemical resistant, lasts almost forever, wash n' reuse. Similar to our Absorb 'N Dry PVA Shammy - but with a honeycombed texture on both sides and has more elasticity. Soft, absorbent PVA shammy sponge; rinses and wrings out to dry and wipe all day and night. Ideal for wiping restaurant tables, lab tables, auto detailing, use as a tack sponge prior to painting. Perfect hand size for fast wiping; resists sticking. Reinforced center makes it very durable, lasts almost forever, wash n' reuse. Get The Big Deal - With or Without the Bucket! The Super Bucket and 14 PVA Sponges, Wipes, and Shammies - Great for Cleanup After Hurricanes, Floods, or Remodeling Jobs! THE SUPER� BUCKET OF PVA SPONGES & WIPES - PERFECT FOR BIG CLEANING JOBS! 335-4576 - The Super Bucket and 14 PVA Sponges & Wipes - If Purchased Individually: $127.24 - Now Just $69.95 - Save Over $57.00! 335-4578 - The Super PVA Sponges & Wipes Package - Same Offer as Above, Except EXCLUDES The Super Bucket. INCLUDES: 14 PVA Sponges & Wipes - If Purchased Individually: $90.39 - Now Just $39.95 - Save Over $50.00!